This morning in our worship service, we heard a beautiful soprano solo rendition of "In the Garden." This song is a favorite for a lot of folks, because it captures a feeling of closeness to Jesus that we long for: he walks with me; he talks with me; he tells me I'm his own. Jesus is that friend who sticks closer than a brother. Jesus is always with us in our hearts. There's an intimacy there that Christians love to celebrate. So it seems a little ironic to listen to "In the Garden" on Ascension Sunday - the song about Jesus' nearness on the day that Jesus left. He had been close enough to walk with you and talk with you ("In the Garden" is about Mary Magdalene in Gethsemane with Jesus in John 20), but then he left, ascended back to heaven, no where to be seen, gone. But Jesus seemed to think it was a good thing for him to go. In John 16, while warning the disciples that soon they won't see him anymore, Jesus said, "Nevertheless I tell you the truth: it is to your advantage that I go away, for if I do not go away, the Advocate will not come to you; but if I go, I will send him to you" (16:7). It's to your advantage that I go away, that I leave you and return to heaven. Well, who is this "Advocate" (or "Helper") he's talking about? It's the Holy Spirit. In Acts chapter 1, Jesus commissions the disciples to go and preach in Jerusalem, Judea, Samaria, and to the ends of the earth - then he jets. Jesus ascends to the heavens, and he's gone. 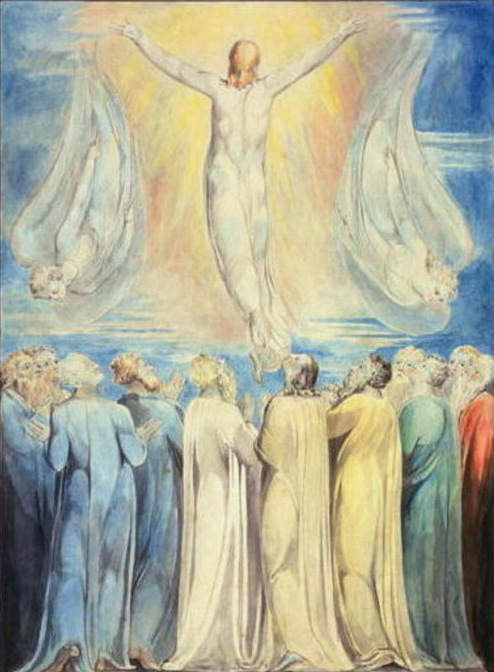 In Acts chapter 2, the day of Pentecost arrives, and the Holy Spirit descends from the heavens, alights on the apostles, and the Church is born. Why is this to our advantage? Why couldn't Jesus just stay? Jesus was so close to his companions that he could touch them, speak with them, eat with them, pray with them. "The Word [Jesus] became flesh and dwelled among us" (John 1:14). But the Spirit doesn't dwell among us; the Spirit dwells within us. God's people, the Church, are the temple of the Holy Spirit (1 Cor 3:16), the place where God lives on earth today. (That's not to say God isn't out and about and at work beyond the Church. God wasn't imprisoned in the Jerusalem temple: that was just the one place God had committed to dwell, where you knew you could encounter the Lord.) The Spirit has committed to dwell within us - not just walking with us and talking with us, but closer, living inside of us! And while Jesus could teach his followers (with varying degrees of success) about the life God intends for us, the Spirit doesn't try to tell us how to live, but transforms us from within. Love, joy, peace, patience, kindness, generosity, faithfulness, gentleness, self-control: these the are the fruit the Spirit would cultivate in our lives (Gal 5:22-23). These things don't always come naturally, and just because you've heard Jesus say to turn the other cheek doesn't mean you've learned the art of peace (for instance), but the Spirit is at work within us, growing these fruit in the Spirit's territory, transforming us from within. And even though Jesus did leave and return to the Father's right hand in heaven, even though Jesus is gone, the Spirit connects us to Christ still. Jesus left, but he is united with the Spirit and the Father, one God, and so the Spirit dwelling in us is the link connecting us to Jesus. It may sound backwards, but Jesus leaving made it possible for us to draw closer to him than ever, through the Holy Spirit living in us. So... the Ascension isn't the day God leaves. It's the prelude to God's arrival, to dwell within us, nearer than any friend or brother. It means God can work in us in new and deeper ways, and we can be connected to Jesus even more intimately than before.